Join us for our very interesting 2 day trip to experience Quebecois wine, cheese & food and of course to visit Montreal. And all in just two days! On Saturday we travel by bus from Toronto to Montreal and upon arrival in the Montreal area, our very first stop is a small family owned winery where we enjoy a wine tasting paired with Quebec cheeses. Following this we check in at our hotel and then head out to a local restaurant for our dinner featuring classic French cuisine. Please note that this dinner is optional and you will have an opportunity to select the dinner during your booking process if you wish to attend. After dinner, there will be an optional visit to the Montreal Casino and again, you are free to skip this and instead enjoy Montreal's nightlife at one of many bars and clubs within walking distance of our hotel. On Sunday, we start our day with a hot buffet breakfast. After checking out, we visit a sugar shack about one hour from Montreal. If you have never visited a sugar shack, then you must do it at least once for the experience. 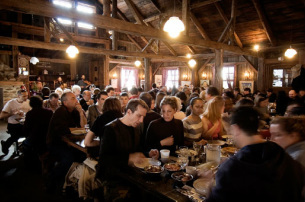 We get a wagon ride, learn all about maple syrup and how it's made and this is followed by a classic Quebecois country lunch including all the standards like pea soup and meat tourtiere amongst an extensive menu. Following our lunch, we travel back to Montreal for a 2.5 hour guided tour of Old Montreal including a visit to the Notre Dame Basilica. Other stops along this walking tour will include Place Royale, Place d'Armes, the Sulpicians' Seminary, City Hall, Château Ramezay, the Notre-Dame-de-Bon-Secours Chapel and Bonsecours Market. And finally, after our walking tour, we board our bus for our return to Toronto. All in all, a very busy 2 days in the Montreal area to give you just a taste of what Quebec is about. No single supplement or surcharge! Travelling by yourself? We guarantee to find you a roommate (of the same gender) or we pay the surcharge! Of course if you wish to have a private room by yourself, no problem, you can pay the Single occupancy rate. Other options are Triple occupancy (if three of you are travelling together and wish to share a room) and Quad occupancy (if four of you are travelling together and wish to share a room). Prices below are in Canadian dollars, taxes are extra. Round trip transportation on highway mini bus. One night's accommodation at the Le Nouvel Hotel & Spa included. Hot buffet breakfast on Sunday morning included. Wine tasting with cheese pairing at Côte de Vaudreuil Vineyards. Group dinner at one of the classic French restaurants in Montreal. This group dinner is optional. Visit to the Casino de Montreal on Saturday evening. This visit is optional. Visit to a sugar shack, wagon rides, maple syrup tour and classic Quebecois lunch included. Guided 2.5 hour tour of Old Montreal including guided tour of the Notre Dame Basilica. There are 5 pickup locations in the Toronto area. Woodbridge, Hwy 400 & Hwy 7. Mississauga, Hwy 401 & Hurontario. We leave Toronto on Saturday morning at approximately 8:00 AM. Actual pickup times vary by stop and will be sent out in the final email to all registered attendees, 3 days before the trip. We return to Toronto at approximately 10:00 PM on Sunday night. Children 10 and older are welcome on this trip. Price is $20 less per child. 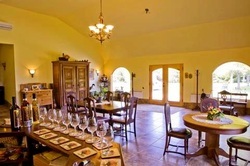 Children will not be allowed to consume wine during the wine & cheese tasting session. Our first stop on Saturday, as we are heading into Montreal, will be a small family owned winery where we will get to sample wines paired with Quebec cheeses. This is sounding good already and we've barely started. After our wine & cheese tasting, we drive to our hotel, the 3-diamond rated Le Nouvel Hotel & Spa. We check in, freshen up and change and then it's time for dinner! Our dinner this evening will be at a restaurant known for it's classic French cuisine, the Restaurant Plein Sud. 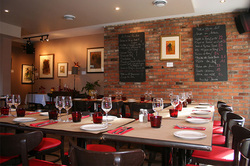 We have a lovely menu for our group with lots of choices to suit all palates. Vegetarian option will be available. Please note that this dinner is optional and not included in the tour price. You will have an option of selecting this if you wish to join us for dinner. Otherwise there are numerous dining options near our hotel for you to take advantage of. After our dinner, we have an optional visit to the Casino de Montréal located on the Île Notre-Dame. 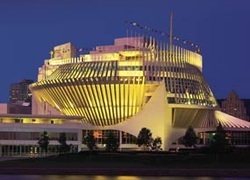 It is the largest casino in Canada, and consists of three interconnected buildings, two of which, the French Pavilion and the Québec Pavilion, were built for Expo 67. Sucrerie de la Montagne is an authentic “sugar shack” in Quebec, one hour west of Montreal. Designated an official Québec Heritage site, it's located in the midst of a 120-acre forest of century-old maples atop Mont Rigaud and transports its visitors back in time, providing them with a momentary glimpse of life as it truly was for Québec and Canadian pioneers. Today, you will experience a "sugaring off" festival. You'll start with a wagon ride, followed by exploring how maple syrup is tapped and made. And then of course, you will sit down to just about as classic a Quebecois lunch as you are likely to experience. The menu will include mountain dweller's pea soup, sugar-cured country ham, meat pie from Québec's Beauce region, traditional meatball stew, wood-fired baked beans, homemade fruit ketchup & pickles, pancakes with maple syrup and sugar pie and so much more. You will also have an opportunity to explore the sugar shack grounds and even shop in the general store for products that you are unlikely to find anywhere outside of Quebec. After all that food we surely need to walk it off so we now head to Old Town Montreal for our guided walking tour. 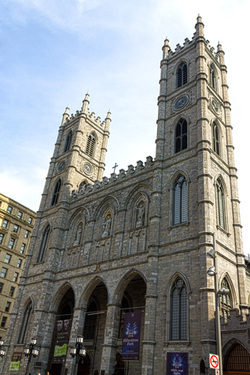 We will break up into smaller groups and each group, accompanied by their English speaking tour guides, will now spend the next 2 and a half hours exploring Old Montreal, starting with the simply amazing Notre Dame Basilica. The tour will also include Place Royale, Place d'Armes, the Sulpicians' Seminary, the Bank of Montréal, City Hall, Château Ramezay, the Notre-Dame-de-Bon-Secours Chapel and Bonsecours Market. And then, after our walking tour and our two days of an authentic Quebec experience, we board our bus and make our way back to Toronto.